Compiled by Hampus Eckerman: I tried to write down a schedule of all filers that are part of programming on Worldcon. If you’re a commenter or a lurker here, and you’d like to have your programming items added to this list, please comment below or send an e-mail to mikeglyer [at] cs [dot] com. Pixel Scroll 3/21/18 Where In The Scroll Is Pixel Sandiego? 12 out of 19 short fiction Nebula finalists[Highlight Nebula+2], though the finalists were announced before Hugo nominations closed. (2) DUBLIN 2019 FAMILY SAVINGS. The Irish Worldcon has a plan: “If you are bringing your family, a family plan might save you a bit of money”. 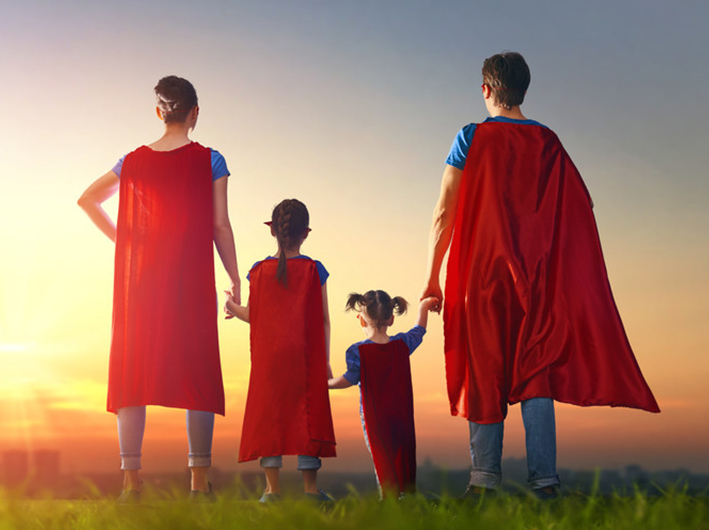 Dublin 2019: An Irish Worldcon has announced a new family plan for those members who are attending with members of their family. If you sign up for a family plan you will receive 10% off the total costs for the included memberships. This new plan can be used in conjunction with the recently announced Instalment Plan as long as the Family Plan is set up first. The Dublin 2019 Family Plan enables fans to bring their whole family with them and save 10% on the total costs of memberships. A family plan will consist of 2 “Major” and at least 2 “Minor” Individuals. A “Major” membership is an individual born on or before 15 August 2001 (18+ on the first day of the convention). “Minor” memberships are individuals born between 16 August 2001 and 15 August 2013 (ages 6-17 on the first day of the convention). There is also a single parent variation. Details can be found on the website. Under the Plan, you first buy a Supporting Membership and then fill in the Dublin 2019 Family Plan Request form. The registration team will then be in touch with your membership invoice. The charge for your family plan will be frozen at the time your application is received, accepted, and calculated. If you have not chosen to apply for the instalment plan we will issue an invoice for the balance which you will have 30 days to pay. If that lapses without payment, then you will need to start the process over again, and costs will be calculated from the date of new application. With the Attending Membership rates rising at 00:01 hours Dublin time on April 3, 2018, this is an ideal time to consider a Family Membership Plan and ensure that you and your family can attend Dublin 2019 at the current cost. Full terms and conditions for the Dublin 2019 Family Plan can be found at www.dublin2019.com/family-plan/. 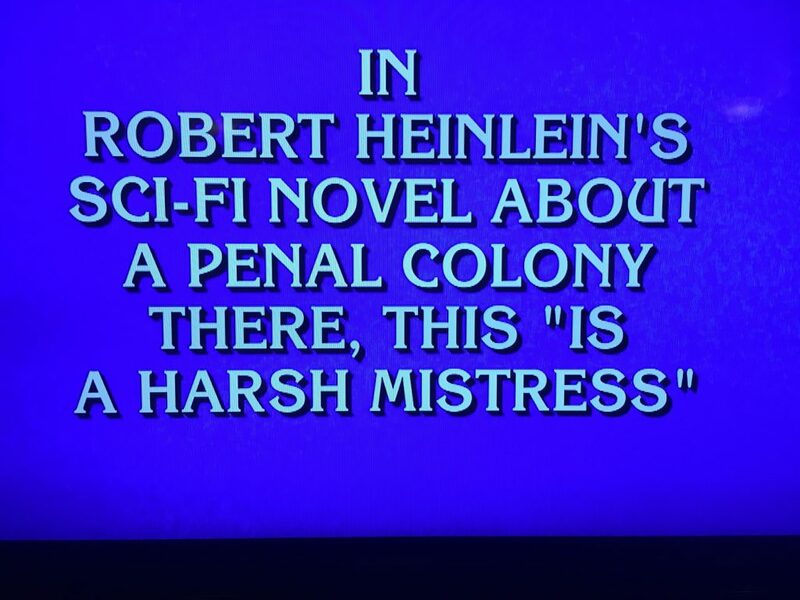 (3) JEOPARDY STRIKES AGAIN. Andrew Porter watched the first Jeopardy! contestant make a miss-take. Rich Lynch says a second contestant got it right. (4) AND ANOTHER GAME SHOW REFERENCES SF. Did I mention, The Chase is my mother’s favorite TV show? (5) DON’T BITE WIZARDS. Middle-Earth Reflections continues its series with “Reading Roverandom /// Chapter 1”. Rover’s adventures begin one day when he plays with his yellow ball outside and bites a wizard for taking the ball, which is not to the dog’s liking. The animal’s misfortune is that he has not got the slightest idea that the man is a wizard because “if Rover had not been so busy barking at the ball, he might have noticed the blue feather stuck in the back of the green hat, and then he would have suspected that the man was a wizard, as any other sensible little dog would; but he never saw the feather at all” (Roverandom, p. 41-42). Being really annoyed, the wizard turns Rover into a toy dog and his life turns upside down. It is because of such poor control of emotions that Rover is bound to embark on an adventure of some kind in a rather uncomfortable form. There also seems to be a lack of knowledge on his behalf. It is not the only time when Tolkien uses the “if they knew something, they would understand a situation better” pattern in Roverandom, as well as in some other of his stories. These references can be either to existing in our world myths, legends and folktales, or to Tolkien’s own stories. In his mythology the character wearing a hat with a blue feather is none other than Tom Bombadil, who is a very powerful being indeed, so a blue feather seems to be a very telling sign to those in the know. (6) ACCESSIBILITY ADVICE. Kate Heartfield tells “What I’ve Learned about Convention Accessibility” at the SFWA Blog. … Can*Con is in Ottawa, Canada in October. My job is pretty minor: I wrote our accessibility policy and revise it every year, and I advise the committee about how to implement it when we have particular problems or concerns. Most importantly, I’m there as the dedicated person to field questions or concerns. The whole convention committee has to be on board. Programming policies affect accessibility. So do registration procedures, party plans, restaurant guides. If anyone involved shrugs it off, accessibility will suffer. From the beginning, every person on the committee of Can-Con, and every volunteer, has been entirely supportive of me and the policy. When I bring a concern to the committee, the response is always constructive and never defensive. There are limits to what we can do, as a small but growing convention, and so much depends on the physical accessibility of the venue itself. But I’m learning that the limits are actually a lot farther away than they might appear, and with good people working together, a lot is possible…. Accessibility is about inclusion, and it’s a broader topic than you might think. Mobility barriers are probably the first thing that comes to mind, and they’re hugely important, but they’re not the whole picture. Accessibility is also about making sure that everyone is called by the correct pronouns and has access to a washroom where they’ll be safe and comfortable. It’s about trying not to trigger allergies and sensitivities. It’s about making sure that people have the supports they need. One of the most frequent requests we’ve had is simply for quiet recovery space. (7) IN THE BEGINNING. Sarah A. Hoyt, having finished her Mad Genius Club series defining various genres and subgenres thoroughly and accurately, has embarked on a specialized tour of different ways to start a story. Today it’s “The Atmospheric”. Very interesting, and besides, there’s a Bradbury quote! 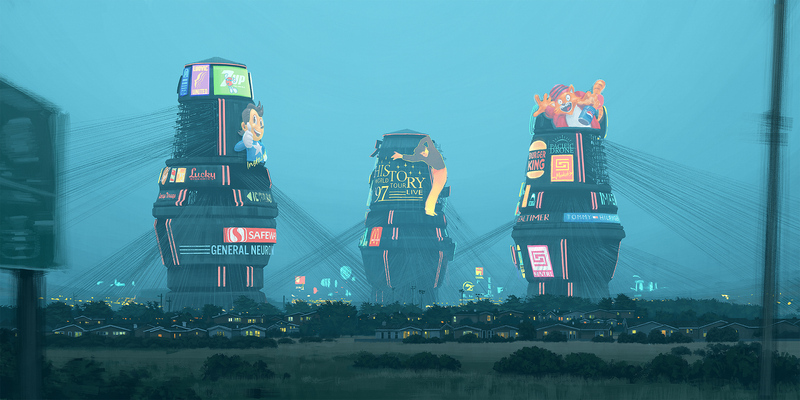 …“In the year A.D. 400, the Emperor Yuan held his throne by the Great Wall of China, and the land was green with rain, readying itself towards the harvest, at peace, the people in his dominion neither too happy nor too sad.” – Ray Bradbury, The Flying Machine. Look at those openings above. They’re obviously not “these people” because except for the first — and it’s not exactly people — there are no people to be “these”. Is there action? Well, sort of. I mean things are happening. But if those are the main characters of your novel they’re kind of weird, consisting of a hole in the ground, a light in the sky, noise and apparently the Emperor Yuan. Of course these are atmospheric beginnings. Atmospheric beginnings are hard to do. It’s easy to get lost in writing about things in general, but will they capture the reader? And while you — well, okay, I — can go on forever about the beautiful landscape, the wretched times, the strange events in the neighborhood, what good is that if your reader yawns and gently closes the book and goes to sleep? To carry off an atmospheric beginning, too, you need impeccable wording, coherent, clear, and well… intriguing. If that’s what your book calls for, a touch of the poetic doesn’t hurt either…. (8) THE BIT AND THE BATTEN. So much for security: “Teenager hacks crypto-currency wallet”. The firm behind the wallet said that it had issued a security fix. It is believed the flaw also affects another model – the Nano Blue – and a fix for that will not be available “for several weeks”, the firm’s chief security officer, Charles Guillemet told Quartz magazine. (9) FINAL HONOR. BBC reports “Stephen Hawking’s ashes to be interred near Sir Isaac Newton’s grave”. The ashes of Professor Stephen Hawking will be interred next to the grave of Sir Isaac Newton at Westminster Abbey, it has been revealed. The renowned theoretical physicist’s final resting place will also be near that of Charles Darwin, who was buried there in 1882. (10) SKY CEILING. In the Netherlands, “The world’s oldest working planetarium”, over two centuries old. There was a beat of silence as the room’s atmosphere shifted from inward reflection to jittery disbelief. “How is that even possible?” said one visitor, waving a pointed finger at the living-room ceiling. “Is it still accurate?” asked another. “Why have I never heard of this before?” came the outburst from her companion. Craning my neck, I too could hardly believe it. On the timber roof above our heads was a scale model of the universe, painted in sparkling gold and shimmering royal blue. There was the Earth, a golden orb dangling by a near-invisible, hand-wound wire. Next to it, the sun, presented as a flaming star, glinting like a Christmas bauble. Then Mercury, Venus, Mars, and their moons in succession, hung from a series of elliptical curves sawn into the ceiling. All were gilded on one side to represent the sun’s illumination, while beyond, on the outer rim, were the most-outlying of the planets, Jupiter and Saturn. Lunar dials, used to derive the position of the zodiac, completed the equation. The medieval science behind the Royal Eise Eisinga Planetarium is staggering, no matter how one views it…. (11) NIGHTLIGHT. The Independent tells readers: “Mysterious purple aurora dubbed ‘Steve’ by amateur stargazers spotted in Scotland”. 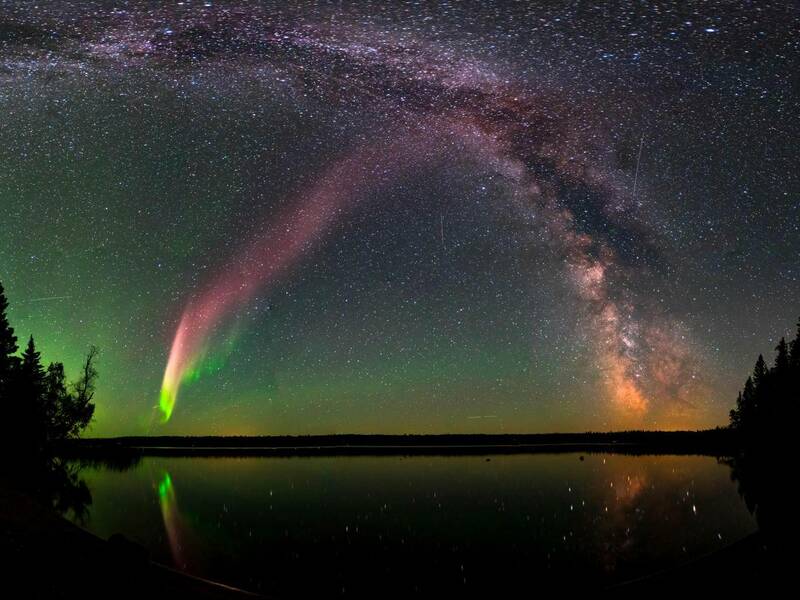 Stargazers were treated to a rare and mysterious sight named “Steve” as it lit up the night skies. The unusual purple aurora was first discovered by a group of amateur scientists and astrophotographers who gave it the nickname, Nasa said. (12) NIGHTFLYERS. Here’s a teaser from the Syfy adaptation: “‘Nightflyers’: Syfy Unveils First Footage of George R.R. Martin Space Drama”. A day after replacing showrunners, Syfy has unveiled the first look at its upcoming George R.R. Martin space drama Nightflyers. Nightflyers is, without question, a big swing for Syfy. The drama, based on Game of Thrones creator Martin’s 1980 novella and the 1987 film of the same name, follows eight maverick scientists and a powerful telepath who embark on an expedition to the edge of the solar system aboard The Nightflyer — a ship with a small, tight-knit crew and a reclusive captain — in hopes of making contact with alien life. But when terrifying and violent events begin to take place, they start to question each other, and surviving the journey proves harder than anyone thought. (13) JOB APPLICATION. A video of Shatner and Nimoy at Dragon Con is touted as “the funniest Star Trek convention of all time” by the poster. (14) IMITATION IS THE SINCEREST FORM OF FLATTERY: Jason sends word that Featured Futures has added a couple of items regarding markets receiving accolades and magazines receiving coverage by prolific review sites. The following is a list of short fiction markets which had 2017 short stories, novelettes, or novellas selected for a Clarke, Dozois, Horton, or Strahan annual or which appeared on the final ballot of the Hugos or Nebulas. They are sorted by number of selections (not individual stories, which sometimes have multiple selections). This is a variant of “The Splintered Mind: Top Science Fiction and Fantasy Magazines 2017.” This only tabulates six factors over one year rather than the many factors over many years of the original. That version helps flatten out fluky peaks and valleys but this provides an instant snapshot of major accolades. (This version also includes whatever venue the stories come from while that version focuses on magazines.) I’d thought about doing this before but stumbling over that finally got me to do it. This page presents a table of the science fiction, fantasy, and horror magazines covered by five “prolific review sites.” Its primary purposes are to help people find the coverage of the zines they want to read about and/or to help them see which zines are covered from multiple viewpoints. This is a variant of Rocket Stack Rank‘s “Magazine Coverage by Reviewers.” There are two significant differences and a minor one. First, this lists all the magazines regularly covered by the reviewers. Second, the list of reviewers includes Tangent Online but not the editors of annuals who presumably read most everything but don’t maintain review sites (though Dozois, Horton and others do review recommended stories for Locus). The minor difference is just that there’s no number column because this isn’t being done for “stack ranking” purposes. (15) UP TO SNUFF? Zhaoyun covers a feature available on Netflix in “Microreview [film]: Mute, directed by Duncan Jones” at Nerds of a Feather. The name ‘Duncan Jones’ will immediately evoke, in the minds of the small but powerful(ly voiced) group of cine-nerds, the masterful 2009 film Moon, and/or the respectable cerebral (get it?!) thriller Source Code of 2011. Garden-variety meathead non-nerds, on the other hand, might recall him as the director of the 2016 video game-to-film adaptation of Warcraft—you know, the movie that absolutely no one was eagerly awaiting. No matter your nerd credentials, then, you probably associate Duncan Jones with a certain cinematographic pizzazz, and like me, your expectations were probably quite high for his latest brainchild, the only-on-Netflix 2018 futuristic neo-noir Mute. The question is, were those expectations met? (16) PASSING THROUGH. Renay praises a book: “Let’s Get Literate! In Other Lands by Sarah Rees Brennan” at Lady Business. What It Is: As the title of this short story implies, it is a history of sorts of the people behind the teeth that George Washington bought to use for his dentures. Structured into nine sections, the story builds up a wonderfully imagined alternate past full of magic, monsters, and war—even as it uncovers the exploitation and abuse lurking at the heart of the very real history of the United States of America. Each story explores a different aspect of the past through a fantasy lens, and yet the truth of what is explored—the pain and atrocities that people faced under the rule of early America—rings with a power that echoes forward through time, reminding us of the origins, and continued injustices, of this country…. (18) RUSS TO JUDGMENT. Ian Sales takes a close look at “The Two of Them, Joanna Russ” (1978) at SF Mistressworks. …The depiction of Islam in The Two of Them would only play today on Fox News. It is ignorant and Islamophobic. Russ may have been writing a feminist sf novel about the role of women, but she has cherrypicked common misconceptions about women in Islamic societies as part of her argument, and ignored everything else. This is not an Islamic society, it’s a made-up society based on anti-Islamic myths and clichés…. There’s a good story in The Two of Them, and the prose shows Russ at her best. Toward the end, Russ even begins breaking the fourth wall and directly addressing the reader. The narrative also discusses alternative outcomes of Irene’s story, probabilistic worlds and events that would naturally arise out of the premise of the Trans-Temporal Authority. Her depiction of Irene, contrasting both her lack of agency in 1950s USA and her agency in the Trans-Temporal Authority, makes an effective argument. But the attempt to contrast it with Islam is a definite mis-step…. (19) AUDIENCES LOVE NEXT DEADPOOL. The Hollywood Reporter learned “‘Deadpool 2’ Outscores Original in Test Screenings”. The Ryan Reynolds-fronted sequel has been tested three times, with the scores for the first two screenings coming in at 91 and 97. The final test, which occurred in Dallas, tested two separate cuts simultaneously, which scored a 98 and a 94. The 98-scoring cut is the version the team is using, a source with direct knowledge told THR. The crew attended the final screenings in Dallas, and a source in the audience of the 98 screening describing the environment to THR as being electric and akin to watching the Super Bowl. It’s worth noting the highest test screening the original Deadpool received was a 91, according to insiders. The film went on to gross $783 million worldwide and stands as the highest-grossing X-Men movie of all time. (20) VIDEO OF THE DAY. “Isle of Dogs: Making of: The Animators” is a look at how 27 animators and ten assistants used state-of-the-art animation to make – you guessed it — Isle of Dogs.. 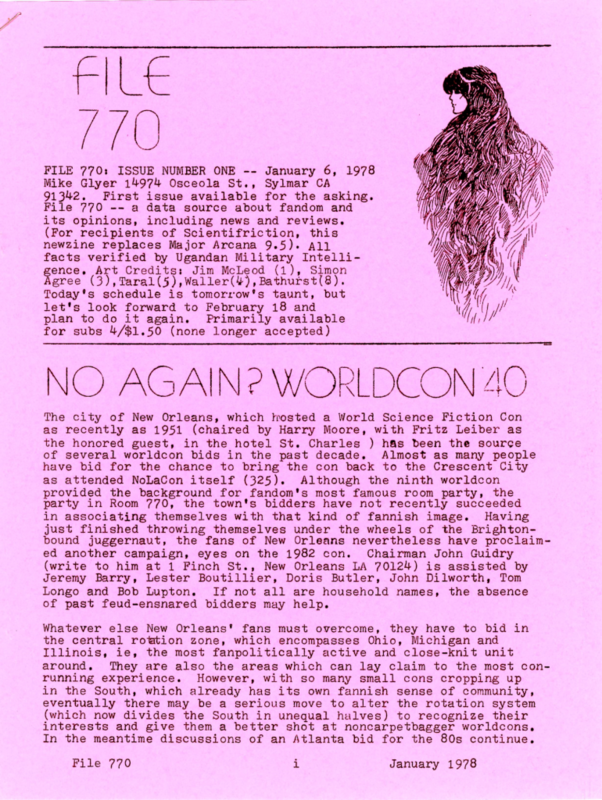 Okay, never mind the rest of that… but on January 6, 1978 File 770 began life as a paperzine with issue #1. Several friends have been along for the entire ride, like artist Taral Wayne, who had an illo in the first paper issue, and also is the creator of the banner art for this blog. Or Steve Davidson, mentioned in a news item on page 2. Not to mention the many who were on the mailing list from the beginning. I also want to thank Linda Bushyager, editor of Karass, which preceded File 770 as fandom’s newzine of record, for passing the baton those many years ago. And thanks to the generosity of everyone who has shared their stories, events and concerns in these pages over the years. 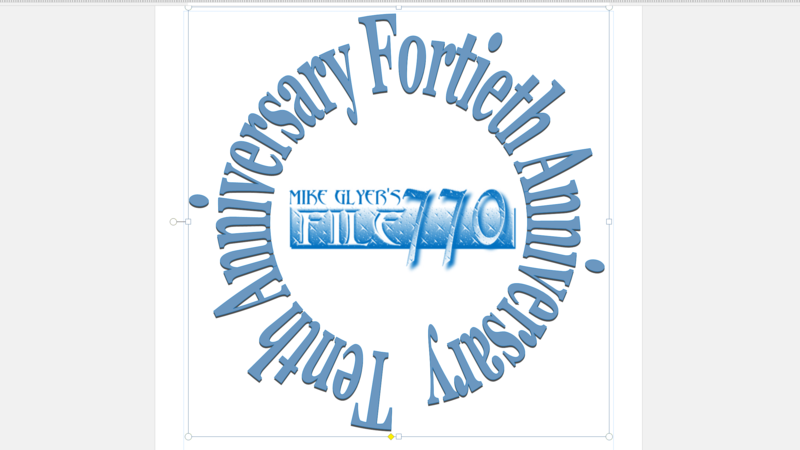 We’ll be celebrating this anniversary — and the 10th anniversary of this blog on January 15 — over the next 10 days with a series of special guest posts, too. Watch for the logo! 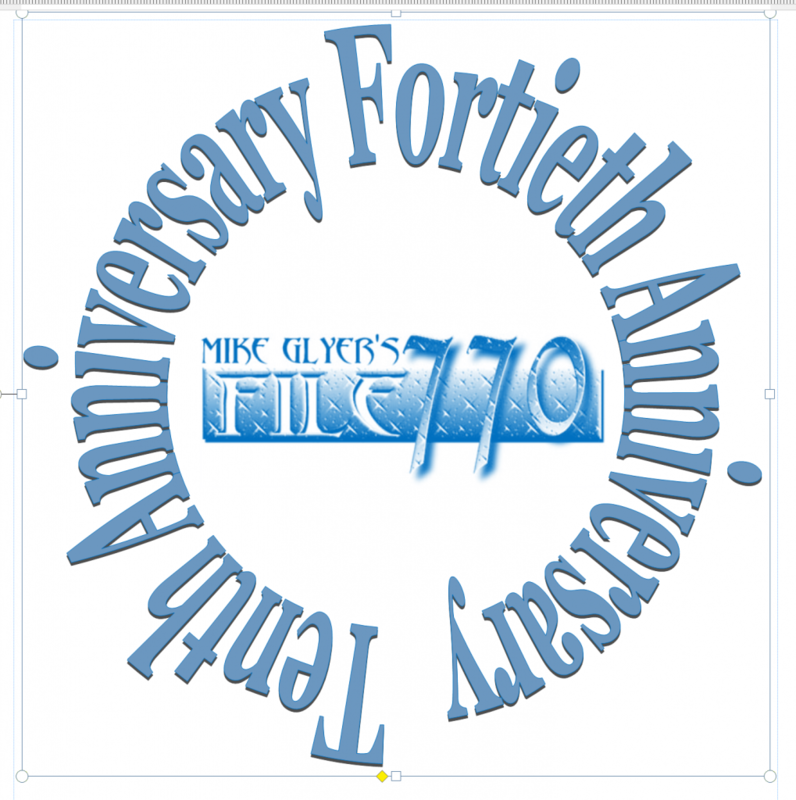 File 770 reaches two big milestones in January 2018, the 40th anniversary of the fanzine (January 6), and the 10th anniversary of this blog (January 15). (1) AND THEY’RE OFF. Fictional horses, ranked by their chances. Emily Temple handicaps the field in “Who Will Win The Literary Kentucky Derby?” at LitHub. Finishing at the back of the field…. Adding the fact that toy horses are generally smaller than normal horses, not to mention fantasy horses, it seems unlikely that such a creature could beat any of the others listed here in a race. At least he’s wise, though. Not to mention Real. Imagine him, all Real and worn and loved, his little legs all seamy, limping across the finish line in the dimming afternoon, long after everyone else has gone home…no, you’re crying. (2) STICKING TO IT. 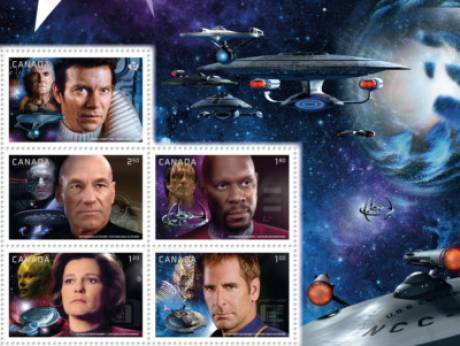 Canada will be issuing another new set of Star Trek stamps this year, featuring the five captains with their ships. Available from Canada post’s website here. The five legendary leaders of Starfleet stand as the paragons of excellence: Kirk (William Shatner), Picard (Patrick Stewart), Sisko (Avery Brooks), Archer (Scott Bakula) and Janeway (Kate Mulgrew) are featured on this collectible pane of 5 stamps. But a hero is nothing without an obstacle, a threat or an antagonist. No villain has tested our protagonists as much as their infamous counterparts: Khan, Locutus of Borg, Dukat, Dolim and the Borg Queen, who shadow the heroes on the stamps. This pane pits each legendary hero against their nemesis on a stylized background containing their respective starships navigating the cold and dark expanse of Federation space. The wormhole from Deep Space Nine also makes a looming appearance. The only thing more stunning than this mini-poster is a phaser. (3) GEEK GENESIS. Patrick Read Johnson’s long-awaited Biopic about being the first Star Wars Geek! Opening 5-25-17 everywhere!!! (4) SIX EASY SLICES. Cat amanuensis Camestros Felapton finds inspiration in the kitchen: “Timothy the Talking Cat Presents: How to cook a frozen pizza the Hugo way”. Frozen pizza: the forbidden food. Yet these instructions defeat me. Yes, I, a cat who can field strip an AR-15 in the dark and without the aid of opposable thumbs, am incapable of reading these tiny instructions or operating the big heaty kitchen box thingy. Time to turn to wiser heads. Who better than the six nominated writers for the Hugo 2017 Best Writey Book Prize! If it worked for Bret Harte, why not Timothy? Yun Tianming listened to the radio from his hospital bed. The United Nations had jointly formed a resolution to condemn the doctrine known as ‘not being arsed to cook anything nutritious’. With the Trisolans a hundred years away from Earth, humanity had, in despair, stopped making an effort to cook anything decent…. (5) WE’RE GOING TO THE VOLCANO TO BLOW UP ROBOTS. National Geographic has changed a lot since I was a kid: “Robot vs. Volcano: ‘Sometimes It’s Just Fun to Blow Stuff Up’”. (6) ALL’S WELLS. Martians meet The Mudlark. “BBC is making a Victorian-era War of the Worlds TV series” says The Verge. The series will be written by screenwriter Peter Hartness, who adapted Susanna Clarke’s Victorian-era fantasy novel Jonathan Strange and Mr Norrell for the network, as well as a handful of Doctor Who episodes. (7) DYING FOR DUMPLINGS. Scott Edelman dines on dumplings and discusses writing with Brenda Clough in Episode 36 of his Eating the Fantastic podcast. 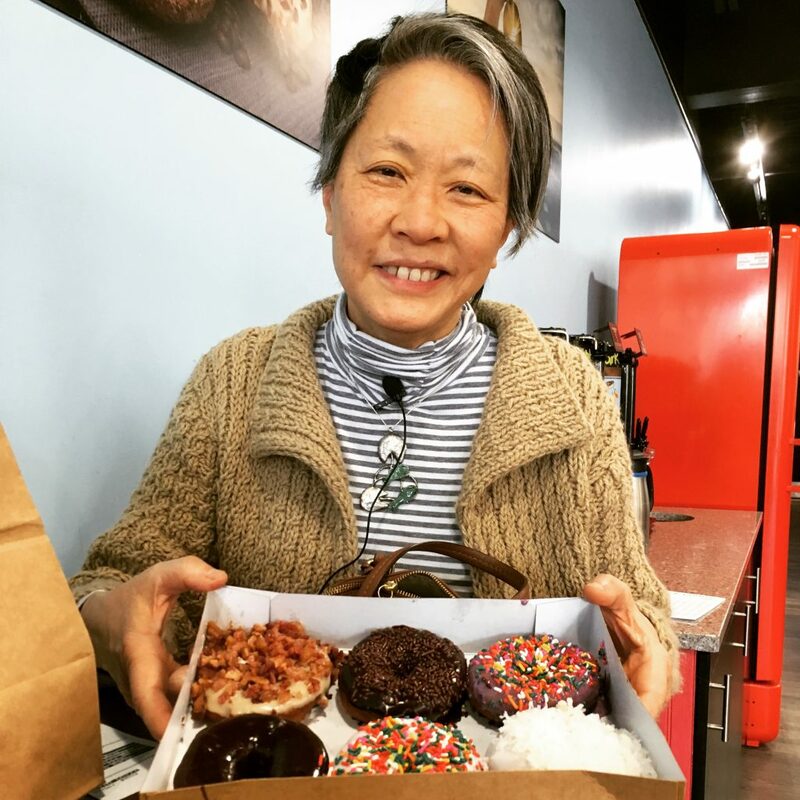 During last year’s Capclave in Gaithersburg, Maryland, Brenda Clough tantalized me with tales of JDS Shanghai Famous Food, telling me they made some of the best soup dumplings in the D.C. area. So when it was time for her appearance on Eating the Fantastic, how could we go anywhere else? Brenda has published short fiction in Analog, Alfred Hitchcock’s Mystery Magazine, my own Science Fiction Age, and many others, and was nominated for both the Hugo and Nebula Awards for her novella “May Be Some Time.” She’s also written many novels across multiple series, and teaches writing workshops at the Writers Center in Bethesda, Maryland. If you’re hungry for more, come back in two weeks when my guest will be Cynthia Felice, who’ll be followed by five episodes recorded during the recent StokerCon: William F. Nolan, Elizabeth Hand, Dennis Etchison, Nancy Holder, and George R. R. Martin. (8) FONDLY REMEMBERED. This video was presented at Costume-Con 35 to recognize members of the community lost in the previous year. Other memorial videos posted on the International Costumers Guild site in the past few months include tributes to the late Robin Schindler, Toni Lay, and Adrienne Martine-Barnes. (9) HOWARD FRANK OBIT. SF Site News reports Howard Frank (1941-2017) died on May 1. Husband of Jane Frank, a Chicon 7 GoH in 2012, he co-authored two books with his wife based on their collection. He won First Fandom’s Sam Moskowitz Archive Award in 2013. Not had enough Star Wars on May the 4th? Thinking of stepping over to the Dark Side? Think you’d be a great Sith? Well keep swinging those light sabers, Revenge of the fifth is here to keep the force going with another Star Wars-themed observance! On the first Friday of each May, space boffins and science fans alike celebrate space with a dedicated day of observance to everything in the great beyond. Because there’s so much out there in space, you can be sure that there’s always going to be enough to celebrate on this day as every year comes! The History of International Space Day International Space Day started out as plain and simple Space Day in 1997. The day was created to observe the many wonders of the unknown space that our planet floats in, and encourage children to have more of an interest in the scientific field. In 2001, Senator John Glenn, himself a former astronaut, changed the day to International Space Day to widen its scope of celebration across the world. The History of Cartoonist’s Day In 1895 a man named Richard F. Outcault introduced a small bald kid in a yellow nightshirt [The Yellow Kid] to the world in an incredibly popular publication in the big apple at the time, the New York World. While the paper itself was looked upon with a sort of disdain by ‘real’ journalists of the time, the yellow kid was embraced by people everywhere. Little did Richard know that when he first created this character, it would lead to a revolution in how stories were told and presented in sequential art pieces (That’s comics kids), but would in fact create a new standard piece of content for newspapers everywhere. Cartoonists’ day was created to celebrate this man and his accomplishments, and all the good he brought to the world as a result. Everything from our Sunday Comics to animation can be linked back to him and his creation. Just a simple bald kid in a yellow nightshirt. May 5, 1961 — From Cape Canaveral, Florida, Navy Commander Alan Bartlett Shepard Jr. is launched into space aboard the Freedom 7 space capsule, becoming the first American astronaut to travel into space. The suborbital flight, which lasted 15 minutes and reached a height of 116 miles into the atmosphere, was a major triumph for the National Aeronautics and Space Administration (NASA). (12) PUZZLE WRAPPED IN AN ENIGMA. Well, now that you mention it…. FARGO. That rocket-shaped award continues to be of interest to those unraveling the mysteries of Fargo. Warning: The Bustle’s episode recap contains SPOILERS. One of the weirder, seemingly superfluous details of Fargo Season 3 comes to the forefront in the spectacularly odd May 3 episode, which focuses on the backstory of Ennis Stussy, née Thaddeus Mobley, and his adventures in science-fiction writing. But is The Planet Wyh a real book? And what about the bizarre events that transpired around the book’s success? The pulpy paperback is first discovered by Gloria Burgle after her stepfather is murdered, hidden in a box under the floorboards of his house. Viewers see the book again — along with a newspaper clipping about Mobley winning an award, and a trove of other books with bizarro titles like The Plague Monkeys, Space Elephants Never Forget, and Organ Fish Of Kleus-9 — in the second episode. And in “The Law Of Non-Contradiction,” Gloria travels to the City Of Angels to do some digging into her stepfather’s secret past. 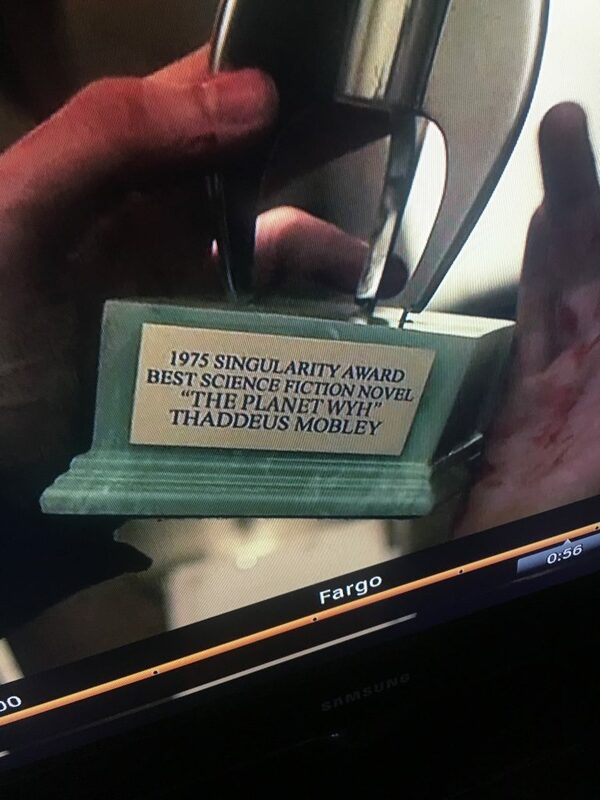 It turns out that, in 1975, Mobley traveled to Los Angeles to accept the prestigious Singularity Award for Best Science-Fiction Novel at the Golden Planet Awards. A producer named Howard Zimmerman quickly approached the naïve author about turning the book into a movie; but as Mobley wrote check after check and no progress seemed to be forthcoming, it eventually became clear that the whole thing was a scam to fund the lavish lifestyles of Zimmerman and his actress girlfriend. Enraged, Mobley assaulted Zimmerman and practically left him a vegetable, fled California, and changed his name to Ennis Stussy — inspired by the brand name of his hotel room toilet. (13) THE WEED OF CRIME. Lou Antonelli ends his feghoot “Calling Grendel Briarton” with a really awful, no good, very bad pun – I liked it. (14) THE SOUND OF WIKI. I just discovered WikiWikiup, a YouTube channel dedicated to making Wikipedia available to people with limited vision. Is this voiced by a robot? (15) WHAT’S THE NEWS ACROSS THE NATION? I also discovered this Puppyish satire about the fate of Castalia House’s The Corroding Empire, masquerading as a report on a daily sf news channel. (16) OH, THE INHUMANITY! The first teaser trailer for Marvel’s Inhumans. (17) STAY UP LATE OR GET UP EARLY. I believe the writer is referring to Eastern time zone: “Eta Aquarid Meteor Shower, Crumbs of Halley’s Comet, Peaks This Weekend: What to Expect”. The annual, week-long Eta Aquarid meteor shower is predicted to reach its maximum on Saturday morning (May 6). The bright moon will be a few days past first quarter (a waxing gibbous, 81 percent illuminated), and it will set just prior to 4 a.m. local daylight time, leaving only about an hour of reasonably dark sky for early morning observations of this shower before the increasingly bright dawn twilight becomes too restrictive. (18) WHO KNOWS? “Why Don’t People Return Their Shopping Carts?” in Scientific American. The world will likely not end because we aren’t returning our shopping carts — that would be an amazing butterfly effect — but it’s an example of a quality of life issue we can control. That guy who didn’t return his cart may not be a complete jerk. He may just be using the example set by others so he can get home a little more quickly. But if everyone does that, then we’re shifting the balance of what is acceptable, which may have greater ramifications to the social order. We have a greater influence over seemingly mundane situations than we realize. (19) CUTENESS CONQUERS. The Life of Death on Vimeo is a video by Marsha Onderstijn about what happens when Death encounters an adorably cute animal! I always enjoy the possibility that if I do something well enough that it might be competitive for a Hugo Award. And I have been very fortunate in that regard. On the other hand, there have been times when I felt it was the right decision to step back for a year, which I did before in 1986 and 1996 for different reasons. And when that happens, I think it is fair to let everyone know, and not put anyone in the position of leaving off their ballots something they would have wanted to vote for if they had known I wasn’t going to accept. I know a few will be disappointed — File 770 is a community effort, and when it is nominated that is symbolic recognition of what everyone contributes, not just my own work. I apologize to anyone who feels let down, though I assure you I thought about the community here when making this complicated decision. In very short order I am expected to send File 770’s entry for the Hugo Voter Packet. It’s going to be a PDF, because you can’t just send them a page of links or something. 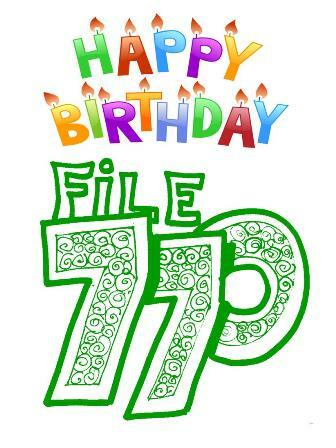 It will include File 770 #165. I will add some posts. I could probably use advice on that — I doubt I will include any roundups, however, there are a lot of article-type posts to consider. That summary post Filers Destroy Poetry will be included. Where I particularly need help is deciding whether and how to represent the comments on the puppy controversies. Out of the literally thousands written here in 2015, there are no small number that could stand alone. Should I cherry pick a bunch, or not? If yes, your recommendations and the links will simplify the search. Thanks for giving this some thought!